Fox News anchor Shannon Bream, who is part of the network’s “news division,” is scheduled to keynote a fundraiser for a conservative group alongside Florida Republican Gov. Ron DeSantis. Bream and DeSantis are set to speak at the James Madison Institute’s 2019 annual fundraising dinner  on April 3. Tickets for the event start at $150. JMI also stated  that sponsors to the event “get access to our VIP reception before the dinner with special guest Florida Attorney General Ashley Moody,” who is a Republican . JMI is a nonprofit organization that describes itself  as “Florida’s premier free-market think tank.” The organization  has  ties  to billionaire industrialists  Charles and David Koch. In 2016  and 2017 , the Charles Koch Foundation gave JMI a combined $392,000 for general operating support. The organization has also praised Florida Republicans such as former Gov. Jeb Bush , and Sens. Marco Rubio  and Rick Scott ; JMI’s CEO and president Robert McClure wrote  that “Florida has been blessed with tremendous, conservative leadership over the past 20 years, championed by the likes of Jeb Bush, Marco Rubio, and Rick Scott, among others.” All three  have also lauded  JMI, while Jeb Bush served  on JMI’s board of directors in the early 1990s. Over the years, JMI has released several “studies” and reports that deny global warming is happening, call for an end to clean energy programs, advocate for expanded offshore drilling despite the risks to Florida’s shores from deeper wells (like BP’s Deep Water Horizon), and push for corporate tax breaks, all of which would directly benefit the Koch brothers’ corporate and personal interests. 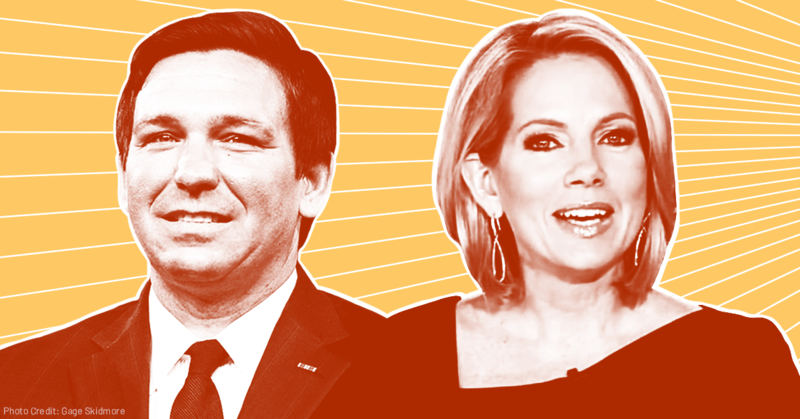 DeSantis has frequently appeared on Fox News, including on  Bream's program . Fox News helped DeSantis win both his  Republican primary  and general  election campaigns  and host Sean Hannity campaigned  for DeSantis in Florida. Media Matters has documented  Bream’s long history of misinforming viewers about reproductive rights topics. She has also helped  champion right-wing efforts to discriminate against LGBTQ people.